Make yourself at home in one of the 45 guestrooms featuring refrigerators and microwaves. Complimentary wireless Internet access is available to keep you connected. Conveniences include phones, as well as desks and irons/ironing boards. Make yourself at home in one of the 34 guestrooms featuring refrigerators and microwaves. Flat-screen televisions with satellite programming provide entertainment, while complimentary wireless Internet access keeps you connected. Bathrooms have showers and complimentary toiletries. Conveniences include desks and complimentary newspapers, and housekeeping is provided daily. Stay in one of 99 guestrooms featuring flat-screen televisions. Complimentary wireless Internet access keeps you connected, and cable programming is available for your entertainment. Conveniences include coffee/tea makers and ceiling fans, and housekeeping is provided daily. With a stay at The Phoenix Hotel, you'll be centrally located in San Francisco, within a 5-minute walk of Van Ness Avenue and Asian Art Museum of San Francisco. This hotel is 0.4 mi (0.7 km) from San Francisco City Hall and 0.3 mi (0.6 km) from Civic Center Plaza. Located 3 minutes’ drive from San Francisco’s Civic Center Plaza, Red Coach Motor Lodge offers free WiFi in every room. This motel features free on-site guest parking. Each warmly decorated completely non-smoking room at this motel features a cable TV with extended channels and a private bathroom. A guests’ only lift is available at the motel for added comfort and security. Featuring live entertainment, Great American Music Hall is just 4 minutes’ walk from Red Coach Motor Lodge. SHN Orpheum Theatre, Civic Center/UN Plaza BART Station and Bill Graham Civic Auditorium are less than 10 minutes’ walk from the property. 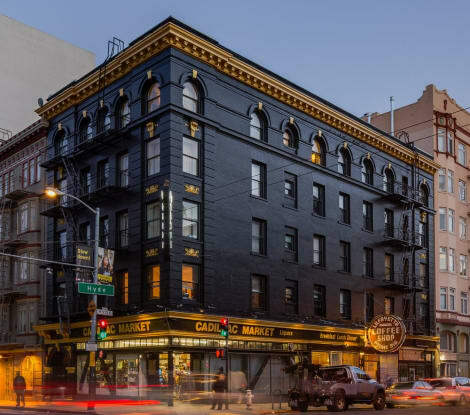 With a stay at The Opal San Francisco, you'll be centrally located in San Francisco, steps from Van Ness Avenue and 9 minutes by foot from San Francisco City Hall. This hotel is 0.2 mi (0.3 km) from The Regency Ballroom and 0.5 mi (0.8 km) from Civic Center Plaza.